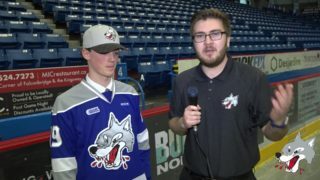 (Greater Sudbury, ON) Wolves hockey action continues this week with triple the action at the Sudbury Arena as they host the North Bay Battalion on Wednesday night, the London Knights on Friday night and the Sault Ste. Marie Greyhounds Sunday afternoon. 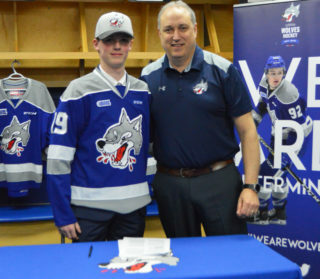 The Wolves are looking to extend their three-game win streak as they are coming off a successful week with a 4-3 win over the Barrie Colts, a 3-0 victory over the Mississauga Steelheads, and a 7-3 win over the Central Division leading Niagara IceDogs. Wednesday, the Wolves will host division rivals the North Bay Battalion at 7:05pm. 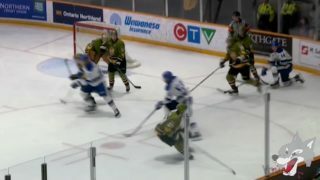 The Battalion sit six points back of the Wolves in the Eastern Conference, but have been hot as of late, holding a record of 8-1-0-1 in their last ten games. The Battalion are led upfront by overage forward Justin Brazeau who has 75 points in just 43 games and sits second in the league scoring. They are also led upfront by Sudbury native, Brad Chenier, who is ranked second in team scoring with 22 goals. Wednesday’s game is sponsored by TSYS who will be on-hand with prizes for fans during the t-shirt toss in the second intermission. Fans are encouraged to visit their table in the lower lobby for more information. 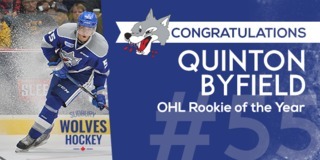 Friday night the Wolves will take on the London Knights at the Sudbury Arena for the one and only time this season. Game time is 7:05pm. 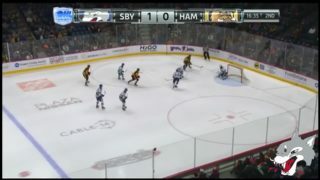 The Knights are ranked first in the Western Conference and Kevin Hancock leads the team with 70 points in just 42 games with both the Knights and the Owen Sound Attack. NHL draft eligible centreman, Connor McMichael is second in team scoring with 49 points in 40 games. Friday’s game is sponsored by Overtime Bar and Grill. Lucky fans will have the chance to win valuable Overtime gift certificate in their second intermission shoot-out contest. Fans can visit the OHL Onside and Voices for Women – Sudbury’s Sexual Assault Centre information table in the lower lobby for the chance to win an Autographed Sudbury Wolves hockey stick. Sunday afternoon, the Wolves will battle the Sault Ste. Marie Greyhounds at 3:05pm. The Greyhounds sit just behind the first-place Knights in the Western Conference standings. The Greyhounds are led upfront by Philadelphia Flyers prospect Morgan Frost and overage forward Keeghan Howdeshell. Frost has 65 points in just 35 games, while Howdeshell has collected 48 points in 42 games. Sunday’s game is sponsored by the Lexington Hotel and one lucky fan will win a free night’s stay and dinner. Sunday’s game also marks Game 3 of the Bell Challenge Cup. The Wolves and L’ACFO have partnered together to bring an in-game bilingual experience for fans and Stef Paquette will take to the Queen Stage powered by MIC. 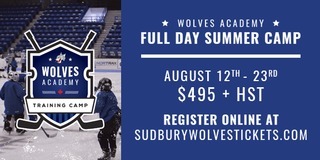 To purchase tickets for any of these games, visit greatersudbury.ca/tickets or Sudburywolves.com and in person at the Sudbury Arena Box Office.